My health has been, let’s say, indifferent over the past couple of months. I’ve had to change some plans, with disappointment, and there may be more of that to come. My rheumatologist has prescribed a new medication and made some adjustments to another; it will take some time to see if this artful combination works. I can’t decide how to punctuate that sentence. I don’t know. It’s been almost ten years since I was diagnosed with Rheumatoid Arthritis. One of the chapters of my book is about how I have used denial to cope. Now, not only am I trying hard to be more realistic, this time I have felt poorly enough that I can’t fake it. I like awake all night. I’m not alone, of course. I have a genuinely and generously supportive wife. The lone, wild bird is a creature of my feelings. I reject the idea of being ill and dependent. I like to do *for* others. I’m an Enneagram 2; it’s a feature of my personality, and it’s been important for me to learn to give without wanting something in return, and to learn when something is mine to do, or not. I understand all that. But must I learn to receive even when I cannot give? I’ll be honest. I hate that. Thus the bird on the roof. Many psalms lay out a complaint, whether a diatribe against oppressors or a lament direct to God. Usually they turn to praise, to some sense of reconciliation with the Lord, some relief of the pain. 102 comes around for one more exclamation in verse 23. My days are cut short because I cannot do all the things I want to do, at home, at work, or at play. And while that is discouraging in the near view, the hardest thing in this illness is how inevitably I get sicker when I am trying to get better. That’s a hard one to punctuate, too. I don’t believe God visited it on me, but I wish I could get a break, some improvement in my health, even a time of staying the same. It seems I need to prepare for more of the inevitable; I will find a way to do it. For now, though, I am trying to feel my feelings. 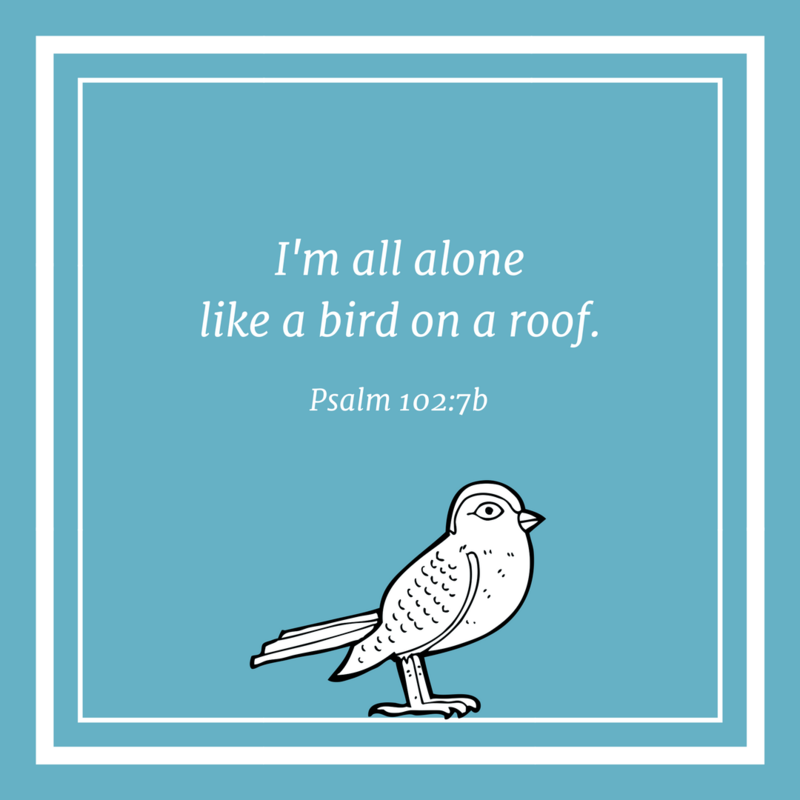 For now, in prayer at least, I’m all alone like a bird on a roof. Thank you for your honesty. I pray you will persevere and accept the loving help your wife and family want to offer. I pray also the Doctors will find a “cocktail” of drugs that will help. The Psalm is pertinent for me as well. For your willingness to speak your truth I am grateful. Thank you for this, Martha. You gave words to exactly where I am, and I couldn’t find any of my own. This is such a blessing. This is right where I am with my RA, as well. Praying for you; please pray for me! I will. And thank you. 1) I believe that the work of my lifetime is to answer this question, “Is this mine to do?” I am still terrible at answering it. I am even more terrible at remembering to ask the question. 2) My heart goes out to you. My wound is not physical. I was swatted out of the sky when my son died. I am no longer on the roof or even capable of knowing that there is a roof. Thanks, Londa. It’s terrible, indeed, to be swatted out of the sky that way. I am finding reading the Psalms in the Common English Bible so, so helpful. They are more raw, and surprisingly pertinent to me and to our world at large. Martha, I feel that I am hearing this psalm for the first time. Thank you for that. I had the privilege of presiding over a Holy/ Maundy Thursday service at a hospice. Reflecting on the John passage, I shared that it is holy both to serve and to be served. At least, that’s what Jesus imaged to me. Holding you in my heart, friend. That’s a helpful reminder, thank you. As a younger person, I observed the adults around me and thought they made aging seemed simple and straight forward. Now at 60, somewhere between young and old, I see now that they were people of grace, who bore great burdens I rarely saw. How can we live when we have increasing pain, or disease, or limitations when our hearts are full of experience, new ideas and plans? Thank you, Martha, for sharing that great struggle from your perch on the roof. Thinking about a Songbird, who flew out of her cage…and transformed into a bird on the roof, uncaged and free in spirit, if not in body. Much love and many prayers for improvement.